Los Angeles, California (June 17, 2016) - - The Sherpa wildfire in Santa Barbara County continues to burn out of control and by Friday morning, has consumed more than 4,000 acres. Pushed by 40 mph winds, the Sherpa fire approached Highway 101 between El Capitan State Beach and Gaviota, forcing the California Highway Patrol to shut down the coastal route overnight. Lt. Jeff Walters of The Salvation Army and Corps Officer in charge of its homeless shelter Hospitality House, located in downtown Santa Barbara, sprung into action. 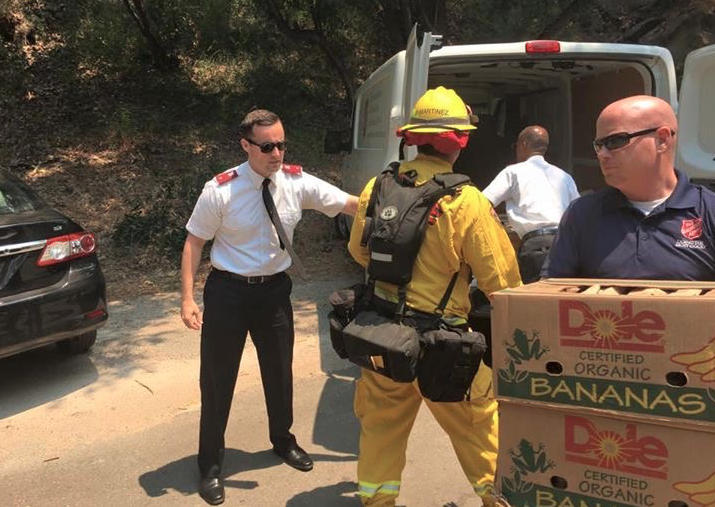 Not only will Hospitality House be providing dinner at the Red Cross evacuation center, yesterday Lt. Walters and staff pushed through the into the canyon where the fire was raging to deliver sack lunches and much needed water to the firefighters on the front line. About The Salvation Army: The Salvation Army, an evangelical part of the universal Christian church established in 1865, has been supporting those in need in His name without discrimination since 1880 in the United States. Today, more than 30 million Americans receive assistance from The Salvation Army each year through the broadest array of social services that range from providing food for the hungry, relief for disaster victims, assistance for the disabled, outreach to the elderly and ill, clothing and shelter to the homeless and underprivileged children. About 82 cents of every dollar raised is used to support those services in 7,000 communities nationwide.